Introducing the smallest and mightiest PSP® system yet. Download rich, immersive digital gaming or the best movies and TV shows saved directly to the ample 16GB hard drive. Browse the incredibly deep lineup of PSP gaming and movie content on the PlayStation® Network. Use built-in Bluetooth support to connect a wireless headset and utilize Skype to talk with friends. 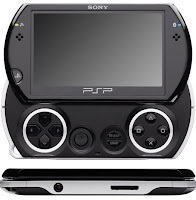 But best of all, show off your content via the ultra-crisp 3.8 inch LCD screen on the most portable PSP system yet.